Still trying to work out a few issues with my Totem machine. One of the insidious ones involves it not wanting to start the game when I hit the front button. Instead I get a taunting whistling sound. Mind you this only happens some of the time (after a successful boot up sequence) but it seems to happen most often after turning the machine on after it's been off for a while. In addition, once it does start any subsequent games seem to start fine. "I have seen it on other system 1 machines if a ground wire is not making a good connection on the MPU. One of the connectors should be reseated possibly"
Anybody got any ideas, things to try, etc? Read this entirely and do what it says. Check ALL the contacts in the connectors for corrosion. If you want bullet proof System 1 performance, you need to do what Clay says. Also once your System 1 is A-OK, a big improvement is the Pascal CPU or All in One PCB. When you say contacts are you referring to the pins on the main chip to the socket, or are we talking the quick connectors from the master board, or both? The card edge connectors typically need to be reworked. It is a painful process to do. What about "sanding" down the connection points that are on the board? Has anyone done that? Dude I bought it from said he had re-pinned a lot of the connectors. Not saying it couldn't be the pins on the connector side, but I'm wondering if trying to lightly file/sand down the connections on the board is something that can be done. Also seeing what looks like it could be corrosion on a couple of the bottom left legs of the main Totem chip. See attached pics. Forgot the link, here it is. You NEED to DO what it says here. Do not take shortcuts or avoid doing what Clay says. At the minimum, check each section, like connectors to make sure they are not corroded and in good electrical shape. If your unwilling to do what's in the System 1 guide, expect and receive problems! It's that simple! Contact or terminals are in the connectors. For an IC I call them legs or leads. The socket would contain contacts or terminals. Regardless, I will repeat it again. Do the system 1 guide if you want a System 1 that will work and be RELIABLE!!! Someone snapped off a leg of your game PROM and then soldered it back on. The corrosion you see is old flux. If you sand the edge connectors, you will need to resurface them with new solder. I wouldnt go this route unless the batteries leaked, or they look very worn. The crimp on contacts inside of the female connector housing is what wears out. Can any Totem owners attest to what the sound in the video I attached is supposed to indicate? Is that the coin-up sound? I've tested the continuity between the game start button and the diodes (diodes on the bottom board all measure around .2) and then the diodes to A1-J6 and they seem fine. Can someone speak to what actually kicks off a new game and sends the ball into the shooter lane? I'm guessing it's some signal coming out of the driver board (perhaps to the game over solenoid below the play field) but I'm not certain. Another clue is that the problem seems to go away after the machine has been running for a while which leads me to believe it's time (and therefore heat) related. Perhaps the characteristics of some component changing once the machine warms up. Also, former owner put a jumper across two of the diodes to put it in free play mode (per the pinrepair.com suggestion). Should I undo this just to see if it changes any of the behavior? Any theories or things to check would be greatly appreciated. From my memory, that is the sound the game would make on coin drop. So, if there is a mod to the start button that somehow feeds the coin switch, that is the sound you are hearing. From what I remember, Gottlieb expanded its sounds by using a switch on the game over relay going to the sound board. So, in Game Over/Attract mode (relay off), the game made one set of sounds (coin drop, attract sound, and maybe game start). Once in game play (relay turned on) the same bell chime outputs now signaled a different set of sounds. Does anyone know what the diodes on the bottom board should read? Mine were between .2 and .3 I believe. Does anyone know what it is that actually starts a new game? Is it a signal coming from the driver board to the Game Over solenoid? I think I may be un-jumpering the 'free game' mod next just to isolate the coin and start game paths. I use a rubber eraser to clean them. Seems to do the trick, and leaves the finish alone, unlike with sandpaper. To the left of the eraser is what has not been cleaned. All the other contacts have been cleaned using the eraser. The eraser removes the tarnish and shines them up well. Thanks for the eraser tip, I may try that. Can anyone respond to Post#13? Trying to isolate what may or may not be happening to result in the game not starting. And it's fixed -- not surprisingly something stupid. After all my tinkering I tried hitting the start game button switch with my flex stone file and it seems to be working fine now. I'm a bit embarrassed but I must say the behavior was very odd. Funny that (a) it would coin up but not start the game and (b) that the problem of it not starting seemed to go away after an undetermined amount of time powered on. I guess all's well that ends well. At least I learned some things. Time to fix a few other minor things with Totem and actually get some games in. Thank you to everyone who replied. Great community. Looks like it was a cruel coincidence. Still experiencing issues. I just cleaned all the contacts on the driver board. Didn't seem to help. Can anyone say if a game is started by a signal coming from the driver board that energizes the Game Over relay? Is there a way to test that the signal is getting there? The coin door switches do not go through the driver board. They go directly to the CPU board. The smallest connector along the bottom edge of the CPU board is the coin door switches. The larger connector to it's left are the playfield switches. The largest connector to the right obviously goes to the driver board, as a point of reference. 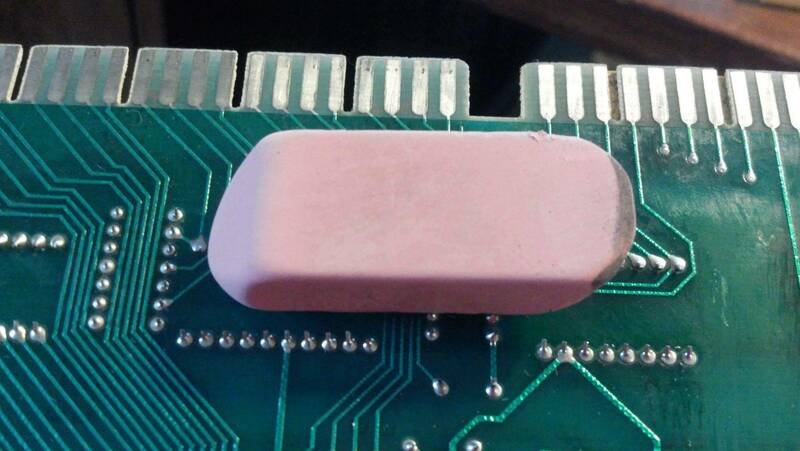 Since the coin door/playfield switch connectors are right under the original battery mount, these are often corroded and need to be re-pinned as a general rule on any system1 game. In fact, i rarely even power up a system1 game until these connectors are re-pinned.... it's that much of a problem. Almost gave up and finally decided to replaced the 7404 and 7405 inverter chip. That did it. Must have been a bad chip. Oddly enough, the two I replaced were socketed. I' m not sure if the original board was configured like that or someone added the sockets after the fact knowing that these chips fail often. Thanks for everyone's input and help. Do not "sand" edge connectors. It ruins them by removing the tin plating and coating them with solder is not a long term repair. It will give you more trouble in the future. You can create a bigger problem than you started with. 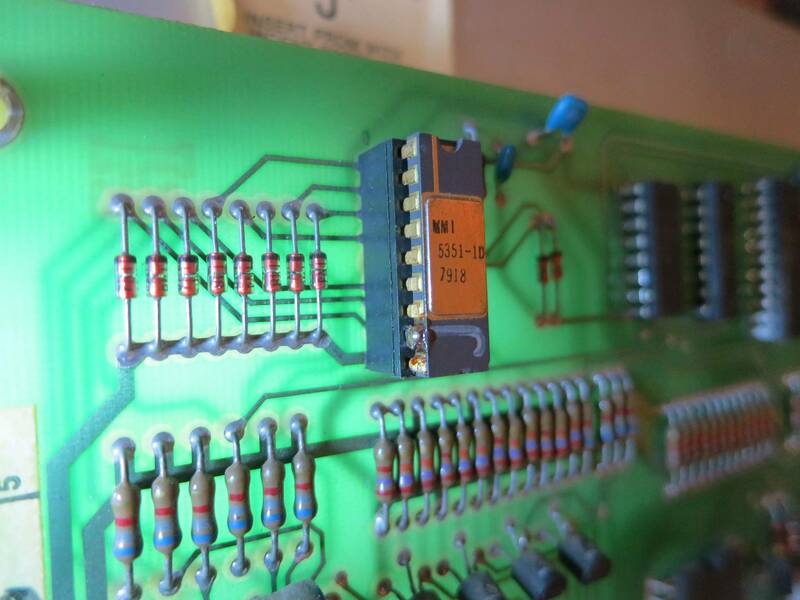 How would you fix a sys1 board with heavy corrosion/rust on the pins then? Sometimes sanding and re-tinning is the only option besides buying a new board. It's great for cleaning up any type of electronic connection and can be used to erase off the coating on traces if you need to add a component in like an LED indicator.